To flip photos on iPhones, iPads, Android phones or other mobile devices, you can convert photos to flip books using VeryPDF Flipbook Maker and then upload the flip books to the online server of VeryPDF. After that, you can flip your landscape photos, animal photos, family photos, etc. on your mobile phones,PC, Mac and share the photos with your others online. Look at the photo flip book below, it is converted from some animal photos. You can open and flip the photo flip book with browsers such as Safari, FireFox, IE and Chrome on your iPhone, iPad, PC, Mac, etc. Right click the icon of VeryPDF Flipbook Maker and hit Open on the pop-up menu to run this application. Hit Input on the main interface of VeryPDF Flipbook Maker. Hit the second radio button before Input pictures under Input in the pop-up dialog box. When the dialog box as below appears, click Add. In the pop-up dialog box, please select photos, and then hit Open.Then, you can view the photos in the list box of the Input Pictures dialog box above. To change the photo order, you can click Up and Down in the Input Pictures dialog box . To resize the flipping page size, you can set width and height at the tool bar of the Input Pictures dialog box. Or you can set the size of the first photo as the default page size for the flip book. To remove some or all the added photos, you can click Remove or Clear. 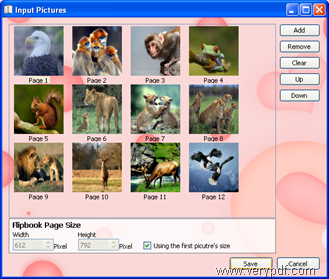 Remove is for delete the selected photo, and Clear is for removing all the photos displayed in the list box. After adding the photos, please click Save in the Input Pictures dialog box. Then, you can go to preview the effect of flip book on the main interface. You can design the flip book on the two panels at the left part of the main interface. The first panel has three tabs: Picture, Button and Online. Picture—You can double click the picture on the Picture tab control to apply the selected picture to the flip book. Then, you can view the background effect in the list box. Button—You can click the Button tab and then double click the icons on the Button tab control to apply the selected set of buttons to the tool bar of the flip book. Online—You can click Online and then select the online picture and set the selected online image as the background of the flip book. Hide buttons—When you embed flip books into your blog and website, you may need to zoom out the flip books. Then, you will need to hide some buttons and only display the selected buttons on the tool bar. Just click the check boxes before the buttons you want to hide. Color—You can set bar color, text color and background color. When you set the background color, the background will be changed from an image to pure color. Background—If you are using an image as the background, you can adjusts the image position by set options in the list box after Background Position. Sound—You can also set options to add a piece of music and flip sound to the flip book. After setting all the options, don’t forget to click Apply under the title bar of the main interface. Click Sign Up to create an count on the VeryPDF Online Server. A valid email address and a username will be required to set up an account. The password will be sent to your email instantly. Type your user name and password click Sign In to access the account. Click Upload to upload the photo flip book. The Upload Successfully dialog box appears, and you can go to view and embed the flip book. You can use Safari to open the photo flip book on your iPhone. Please enjoy flipping through your photo flip book. In case you have some questions, please leave a message. Or, you can contact the Support Group of VeryPDF. How to embed flipbook flash in a webpage? This entry was posted in Flipbook Maker and tagged flip book for iphone, make flip book, photo to flip book. Bookmark the permalink.